We are very excited about four new fabrics that we’re (finally!) almost ready to share with you all!! Look out for these beauties on the Kozy Carrier website and from your nearest Kozy retailer later this week! More detail about the actual prints in a following post. For now I wanted to share with you some of the images from our first photo shoot since taking the reigns of the Kozy empire. We had a fun time with our models (all real Mums and Dads who volunteered their time to help us with the shoot) and Karyn from Images Foreva Photography. This was Karyn’s first commercial shoot (she specialises in family portraiture, particularly young children and babies) and we think she did a great job. We are looking forward to future shoots with Karyn as we roll out more new prints during the year. Now for that sneak peek – starting with the image above. Big brother on Dad’s back was enjoying the photo shoot and started offering creative direction ideas. Here he’s excitedly pointing and shouting ‘hey take a picture of me with that rubbish truck!!!’. Totally cute idea Emmett, but not quite the look we were going for for Kozy. haha. This next image features the same family – following the request to ‘pose like you’re actually walking’, well, interesting walking style Barry!! Giggle city. Even our family dog wanted in on the action in this shot . . .
We’ve seen some photo bombs in our time, but none quite like this!! During our shoot with Amy her wee girl needed some milk. Karyn got this gorgeous shot! 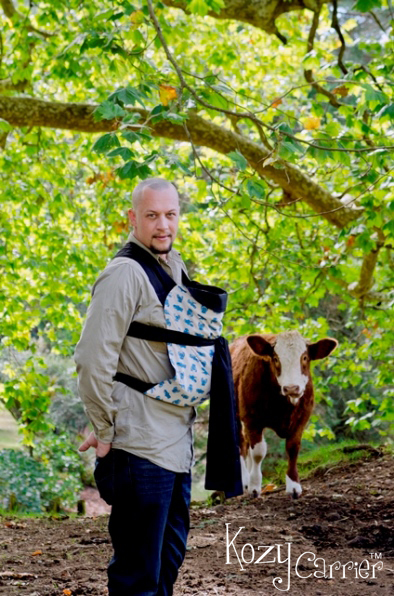 Breastfeeding is so easy in a Kozy – and discreet too! We’ll be releasing the four new prints later in the week – keep an eye on our website, blog, Facebook page and on Instagram (check out hashtag #kozycarrier). 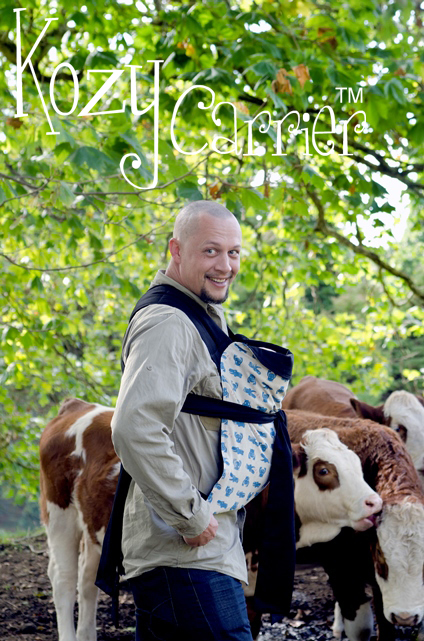 We’re looking forward to hearing what you think of the new additions to the Kozy Carrier Collection! 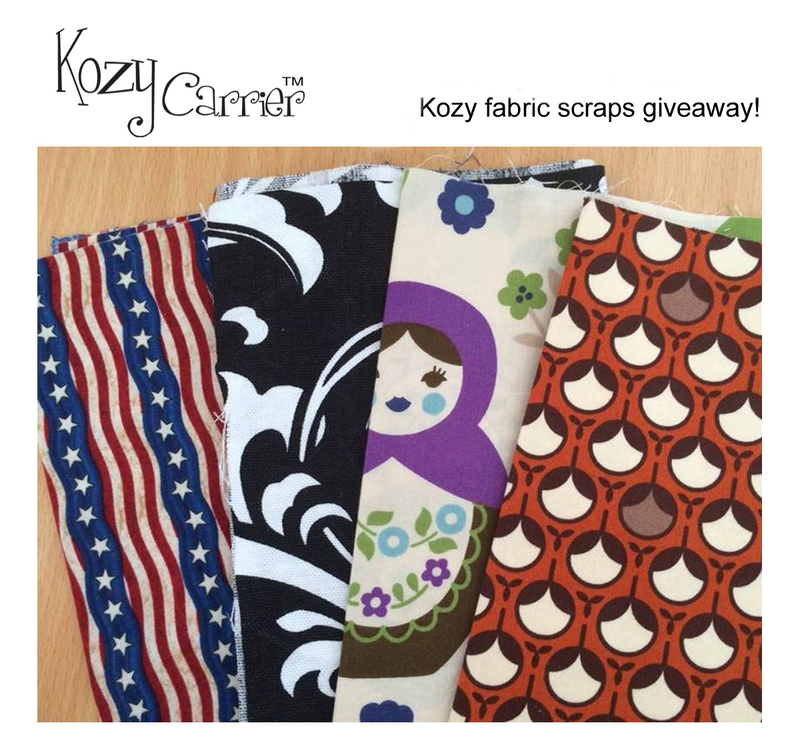 We’ve been running a giveaway over on the Kozy Carrier Facebook page with one lucky person being drawn to win a bundle of Kozy fabric pieces. Each piece is 12″ x 20″ / 30cm x 50cm. We’ve been loving reading about all the things the giveaway entrants would make with these gorgeous pieces of past and present Kozy fabrics. Thanks to everyone who has entered! And the winner is: Rachel Cherry who said she “would make them into a craft bag for my yarn and crochet hooks”. Great idea Rachel. Would love to see a pic of your new craft bag when it’s done! Please message us your address via the Kozy Carrier Facebook page and we’ll get your fabric pieces on their way to you this week! For those of you who missed out, we have three more bundles of Kozy fabric pieces available on the Kozy Carrier website at just US$20 per bundle plus US$12 shipping to anywhere on earth. So pop over to the site and grab them before they’re gone! Hi everyone! Lots is happening behind the scenes here at Kozy Carrier HQ and we’re getting ready to reveal some new fabrics for the Kozy lineup!! But first we need to organise a photo shoot and we’d love your help! If you’re a parent with a child in one of the following age brackets we’d love to hear from you! You will need to be available on the morning of Sunday 30th March 2014 at Cornwall Park in Auckland for 2 – 3 hours. As a thank you each model will receive an 8 x 10 printed image of themselves with their baby in a Kozy Carrier from the photoshoot which will be captured by Images Foreva Photography. The images will be used on the Kozy Carrier website, blog, Facebook page, Twitter, Instagram etc. If you are interested in taking part in this opportunity please contact us via the form below. We’re looking forward to hearing from you! (Applications close on Friday 21st March 2014). Kozy Carrier Has New Owners! 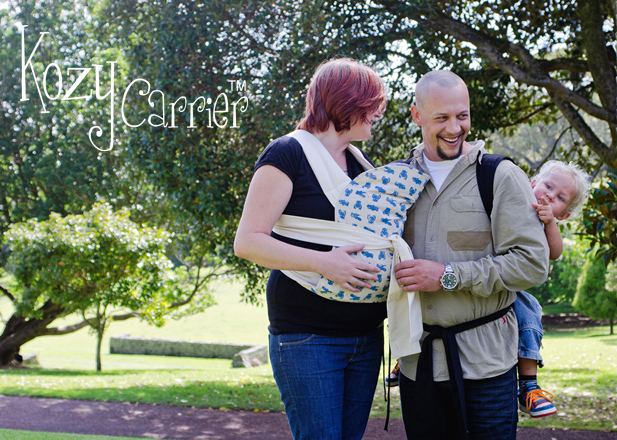 Kozy Carrier has new parents! We have reached an agreement with Helen & Duncan MacMillan from New Zealand to assume ownership of Kozy as of Monday, February 3rd 2014. 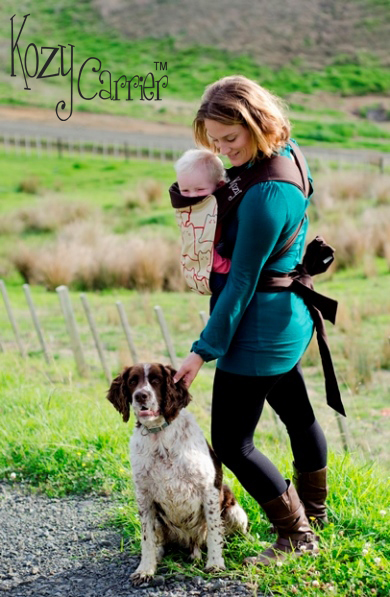 Helen, Duncan and family, with their youngest, nice and comfy in a Kozy Carrier! 2009. 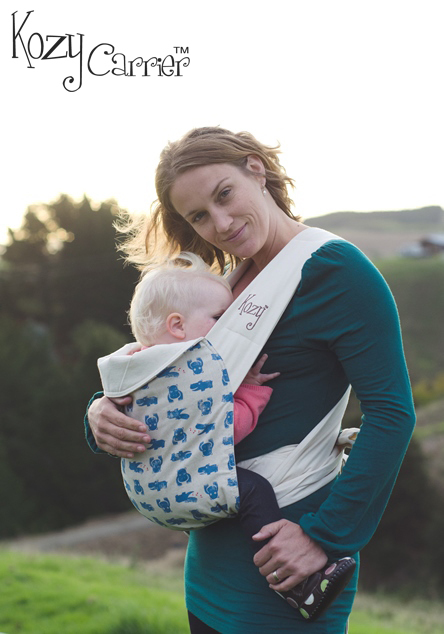 Over ten years ago Kelley made her first mei tai carrier for her own personal use, and it quickly caught on with friends and became the Kozy Carrier…now recognized around the world as the “gold standard” of mei tai styled soft carriers. Much has changed since then and we are both to the point where family considerations preclude us from devoting the time and energy this business requires. To say we are thrilled to pass our “baby” along to the MacMillans is an understatement. 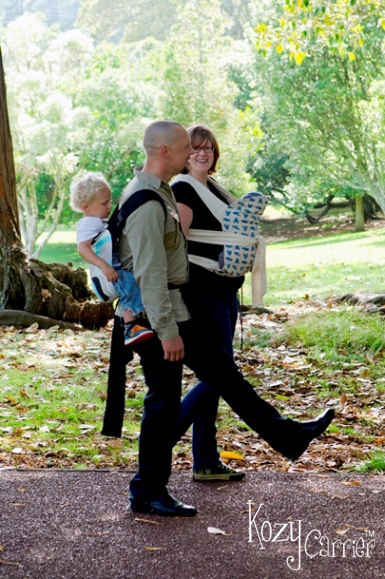 As the owners of My Natural Baby in Auckland, they have been long-time faithful supporters of Kozy and have served as our ‘go to’ distributor for Kozy products in New Zealand, supplying Kozys to over 25 ‘stockists’ through the country. They are devoted babywearing advocates and passionate entrepreneurs…so we expect great things for the Kozy in the future. Of course, with any transition this big, there will be some adjustments. But any questions you may have will be answered promptly, and you can expect the same level of friendly, professional customer service you have come to expect from Kozy. It has been a blessing and our pleasure to serve you over the years. The friendships and relationships we have built with like-minded folks all over the world, who understand instinctively the importance of holding your baby, will always be remembered with fondness. Love to all of you and God’s blessings! Awesome 😜 #flat being jacked up . . .
DJ A in the house! !